CHRISTCHURCH: Kiwis have responded to the Christchurch mosque massacres with an outpouring of interfaith solidarity—crowdfunding millions of dollars, donating halal food and even offering to accompany local Muslims now scared to walk the streets, reports AFP. The murder of 49 people at two mosques in this usually placid city on Friday has sent shockwaves rippling across New Zealand, a country that on average sees no more than 50 murders a year. But revulsion at the bloodshed and the self-declared perpetrator’s racist motives has been matched by displays of support and warmth towards the country’s devastated Muslim communities. In a suburb of Christchurch close to where the shootings took place, Yoti Ioannou and his wife put a shoutout on Facebook calling for locals to donate halal food. Their idea was to provide meals for the dozens of desperate relatives waiting at the city’s hospitals for news of their loved ones as surgeons battled to save lives. The halal food drive was inundated, they said, with lines of people queuing up to give meals throughout Saturday. He said so much food was donated that they eventually had to put a fresh call out saying no more was needed. 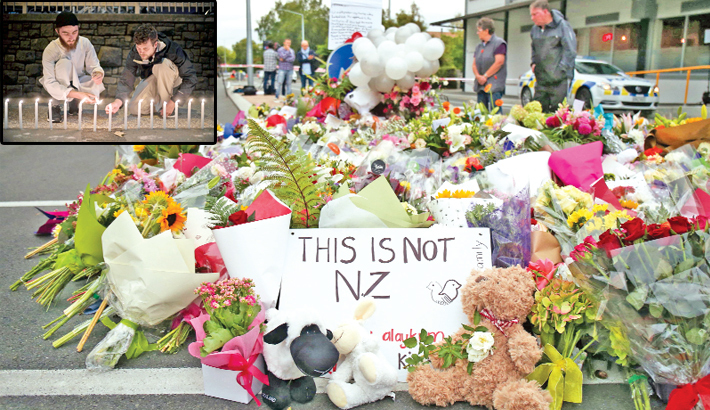 Across the country New Zealanders also dug deep—the two most prominent crowdfunding campaigns had already raised between them more than NZ$3.2 million (US$ 2.2 million) within 24 hours of the shootings on Saturday afternoon. Many of those donating left messages of support incorporating popular Maori terms. “Kia kaha to all New Zealanders, love to all families affected,” read one donation, using a Maori phrase for “stay strong”. Others put out offers for help and support for local Muslims who might be feeling afraid of leaving their houses. In one Facebook post that went especially viral, Wellington native Lianess Howard wrote: “If any Muslim women in Wellington feel unsafe right now—I will walk with you, wait at the bus stop with you, I’ll sit on the bus with you, or walk with you while you do the groceries.” A screen grab of the post placed on Twitter was shared more than 16,000 times. Others came to the police cordons to show support. Wendy and Andy Johnson said that had clipped a silver fern, a national symbol, from their garden to place with the growing bunches of flowers left at the massacre site cordons. “We cut the silver fern out of our garden just to let all our Muslim community know that our hearts are breaking for them today and we stand with them in solidarity,” Wendy Johnson told the StuffNZ website.